Sorry for the late review this time, guys! I’m glad I at least got that new law partner reveal up so we could talk about that, but there’s so much more about this issue to praise and dissect. Alas, work got in the way. (If there’s a Daredevil-obsessed billionaire out there who’d be willing to pay me for writing about Daredevil all day, every day, get in touch and we’ll talk!) On to the review! Daredevil #30 is something as rare in this day and age as an accessible, new reader friendly, done in one story. It is exciting and fast-paced, but still manages to deliver a massive amount of heart and potential office intrigue. Chris Samnee is back on art duty, and does an outstanding job handling the roller-coasteresque action this issue. As much as I enjoyed the great work by Javier Rodríguez in Daredevil #28 and 29, it’s good to see Samnee back in action. And Rodríguez gets to shine as well, the colors in this issue are some of the most stunning I’ve seen from him yet. Before getting back to gushing over the art work, let’s take a look at what actually happens in this issue. As I’ve already divulged in a previous post, Matt’s new partner is *drum roll* Kirsten McDuffie! The way she is introduced is absolutely amazing. The very first page shows Matt thinking back to some of the other women who have come through the Nelson & Murdock law offices over the years. This is communicated by having his inner monologue superimposed on radar impressions of these women. It gives the reader a great reminder of Matt’s senses when he is able to share the non-visual details that made the biggest impression on him. It is also a very clever way to introduce the new player in the book, in the bottom right corner panel, while forcing us to turn the page to learn what Matt already knows. It is clear right from the get go that Kirsten is more than ready to stir things up around the law office, and I am very excited to see what will happen going forward. Knowing how Mark Waid works when it comes to long-term planning, it seems like pretty much anything could happen, something that is further underscored by the last couple of pages of the issue. I feel perfectly comfortable with his taking whatever approach that presents itself naturally. The meat of the issue, however, revolves around things that are literally out of this world. 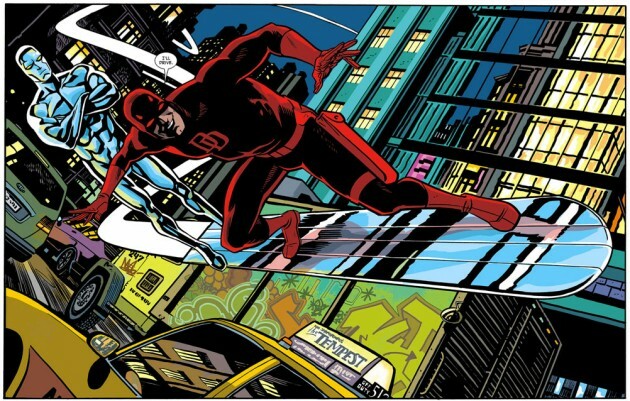 Daredevil’s forays into the cosmic realm of the Marvel Universe have been sparse through the decades. 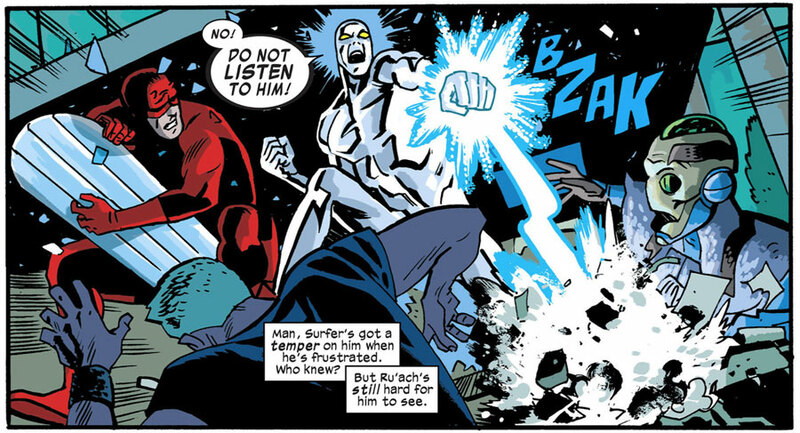 There is a good reason for this, considering the character’s normal milieu and power-set, but here Waid & Co. do a great job making the meeting of Matt and the Silver Surfer seem perfectly logical. As often happens in Daredevil, Matt’s profession as a lawyer serves as the perfect set-up for the story. Here, an alien in apparent need comes to see him in his office. I have to give some serious props to artist Chris Samnee for the wonderful character design. The alien Ru’Ach, a member of the Achian race, has a touch of classical “gray” alien, but the overall look is much more exotic. Details that stood out to me were things like the bird-like tongue and the intricate costume. Very cool! It is at this point that the Silver Surfer shows up to crash the party, and action soon ensues. The creators provide a good “alibi” for the mandatory hero versus hero fight when the Surfer accidentally injures one of Matt’s employees, and the metaphorical gloves come off. Matt being so willing to take the fight outside (by jumping through a window!) with absolutely no regard for his own safety, especially against a much more powerful character, says a lot about Daredevil as a character, and he certainly lives up to his “man without fear” moniker. As the two finally get to talking, Matt learns that the Achians are not what they seem and the two instead team up to tackle this new threat. Waid finds a pretty neat way to explain why someone as powerful as the Surfer would need Daredevil’s help to begin with, and it involves the two characters’ different ways of viewing the world. Finding new and interesting ways to explore the senses, both Matt’s and those of other people, has been a recurring theme in this book, and it is always handled really well. The most enjoyable part of the issue, however, sees Matt insist on having some fun with the Silver Surfer’s board, before they get back to business. Now, I’ll readily admit that this scene might be a bit much for some readers. If you are of the opinion that Daredevil must be written in the Bendis or Brubaker tradition, seeing Matt ask for something this outrageous might very well make you cringe. Personally though, I really enjoyed this twist. As his costumed extra-curricular activities suggest, Matt Murdock is not only interested in justice, he is also an extreme adrenaline junkie. As such, I can definitely see why he would get a kick out of something like this (especially since he’s not legally allowed to “drive” anything else). The artwork throughout these scenes is absolutely stellar, and it is worth noting that Chris Samnee and Mark Waid are once again co-credited as storytellers. The ride through Manhattan is perfectly choreographed and full of energy, and the backgrounds have all the detail required of a high-speed chase through a bustling city. This is also Javier Rodríguez’s chance to shine as the colors in these scenes further add to the energy and really makes every detail pop. The much talked about splash page seen above is an excellent example of the kind of quality this art team is capable of. So far, Mark Waid has been a master at giving us issues that both stand alone really well and work perfectly as pieces of something much bigger and far-reaching. That skill has probably never been more evident than in this issue. This is the kind of self-contained story that can be enjoyed by anyone, regardless of their familiarity with Daredevil, and I really hope that people who have yet to get addicted to reading this title every month consider picking this up. I just could not be happier with where we are right now. Two years into Mark Waid’s run as Daredevil writer, we have seen stories that, if someone had given me a synopsis of them two years ago, would have made me nervous. However, knowing just how in tune he and the rest of the team are with the core values and personality of Matt Murdock, I feel nothing but excitement going forward. The Jester? Sure, why not? Monsters? Bring it! We know it will work, and that every single page will be beautiful! I’m at Baltimore Comic Con! Agree on all points, but I think trying to tackle Silver Surfer would be more like a linebacker trying to tackle a 2-ton bronze statue. Sometimes I get a little sad after a new issue of Daredevil comes out. Because I think, it cannot possibly get any better than this in my lifetime, for both Daredevil and comics in general for that matter. This is as good as it gets folks! Oh, did everyone notice the little “Call Debbie” post it note that fell out of Foggy’s draw? I only read this today because I’m slow like that. I love that Kirsten was making fun of the hat while she was wearing it. And “Oh, whatever” at the people who’d cringe. I started reading during Bendis’ run and still love it, but I enjoyed Matt on the Silver Surfer’s board.